Winter is Here… Is Your Bus Fleet Ready? For kids, winter time means hot chocolate, snowmen and, of course, magical snow days. However, for school administrators, frigid days and inclement weather pose many problems. Whether you are a superintendent, school administrator or transportation director, you need to be prepared for hail and snow. This means making sure parking lots, bus lanes, and walkways are clear and salted. It also means you need to make sure your bus fleet is ready to handle the next few months of slush and black ice. While school buses are statistically safer than other vehicles on the road, they must be kept in proper working condition and able to overcome anything Mother Nature throws their way. A well-maintained bus is still a danger to passengers and everyone on the road if an inexperienced driver operates it. While your school bus drivers may be fine eight months out of the year, the winter months are the most challenging to navigate. Before the first frost, you should take the time to properly train your drivers. Videos: Start with a video presentation that outlines the hazards drivers can expect to face — ice, fog, hail, white-out situations, and rain. The video should also highlight the importance of ensuring buses are free of snow, ice, dirty snow and salt residue. Round-table discussions: Schedule a round-table meeting with every driver on your team. The purpose is to have an open forum discussion where drivers can voice their concerns and ask questions. You can explain basic winter driving techniques and how to handle dangerous road conditions. On-site training: It is also advisable to physically train your drivers in a safe environment. You can have more experienced drivers demonstrate how to properly use braking systems when approaching snow or ice covered roads. While round-table discussions and video lessons are important, on-site training will give your drivers the confidence to navigate winter roads safely. Now that your drivers are ready for the challenges ahead, you need to make sure the vehicles they operate are functioning properly. During the winter months, your drivers should arrive early to make sure buses are clear of snow and ice. Additionally, drivers should turn the heat on before they leave to pick up students. Check wiper fluid levels: Every bus in your fleet should have sufficient wiper fluid. Drivers should also make sure to use winter fluid that won’t freeze up. Ensure wipers are working: Make sure your drivers check their wipers — a tank full of fluid is of no use if the wipers are frozen to the windshield. Even if the wipers are not frozen, check them to make sure they are free of chips or cuts that may affect their ability to remove precipitation from the windshield. Check defroster and heat: Again, it is important that your drivers get to work early in the winter months so they can ensure the defroster and heat are working properly. A malfunctioning defroster can cause a windshield to fog up or freeze over and render the driver blind. Check tires: In the event that the weather is bad enough to require chains, school will probably be closed. However, your drivers should still check their tires to ensure they have proper air pressure and tread to handle slippery conditions. Test batteries: Another reason your drivers should get to work early is to check bus batteries and make sure buses start. Make sure lights are working: It is essential, especially in the winter, that all lights — headlights, rear and brake lights, flashing lights, and interior lights — are working. In white-out conditions, sometimes the only thing other drivers can see are brake lights and headlights. If you’re expecting an especially bad winter, recommend that your drivers keep a container of sand or kitty litter onboard to help with traction issues. 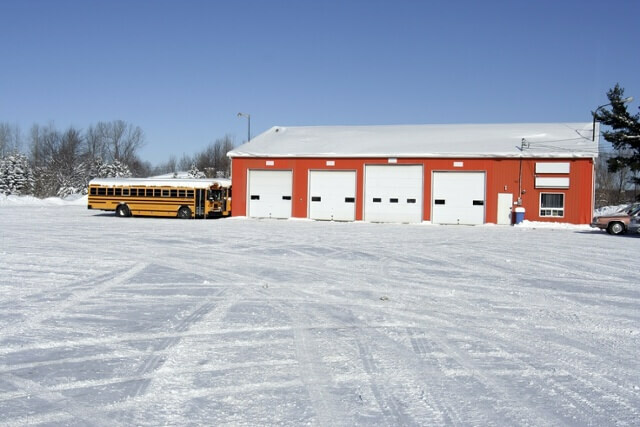 While winter months pose many hazards for school administrators and transportation directors, careful planning and preparation can greatly increase the safety of your students and drivers.